M1EZ8 provides peace of mind with comprehensive detection and reporting capabilities to protect what matters most. Easy system expansion and support for wireless sensors ensure M1EZ8 is the right fit today and in the future. 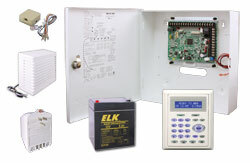 • 12 On-Board Outputs: 1 siren driver/voltage, 1 form “C” Relay, and 10 low current (10 mA) voltage outputsclock to manage and control lights, thermostats, water valves, garage doors, gates and more. With timely access to information and simple, user-friendly interfaces, M1EZ8 keeps you informed and in control. It’s easy to access the system from anywhere with popular smart devices. No monthly fees required!